Hearts came from behind to see off the Pars and move into the fourth round of the Co-operative Insurance Cup. Striker Graham Bayne fired the First Division side in front at Tynecastle after 15 minutes. But Csaba Laszlo's side responded strongly after the break and restored parity through Gary Glen's header. Hearts dominated from then on and secured victory when Michael Stewart fired home from the spot after David Obua was fouled by Neil McGregor. Glen had been brought into the side to replace the injured Andrew Driver, and early on Hearts lacked a cutting edge. Dunfermline had an excellent chance to take the lead but Greg Ross's volley was comfortably saved by Janos Balogh. The visitors took the lead after quarter of an hour when Bayne ran on to Ross's reverse pass and his shot found its way through Balogh. Marius Zaliukas headed home Craig Thomson's 35th-minute free-kick but was flagged for offside and the Lithuanian volleyed over moments later. Hearts equalised when Glen headed home Obua's cross 11 minutes after the break as the hosts began to dominate. Balogh was alert to the danger when he palmed away substitute Joe Cardle's effort before Hearts scored a controversial winner. McGregor surrendered possession to Obua but appeared to have recovered the ball with a shoulder charge on the Hearts midfielder. However, referee Brian Winter pointed to the spot and Stewart sent Greg Fleming the wrong way to send Hearts through. "It was a typical cup game, especially in the first 45 minutes. "We won the game in the second half and I must pay Dunfermline a compliment for the way they played. "The referee had a choice to give one penalty out of four, so this is okay. "We lost a lot of energy in the game against Celtic, but in the second half tonight we showed a much better attitude. "This wasn't an easy game to win. We had chances to score more goals." "We played very well in the first half and passed the ball well. "We set up 4-2-3-1 and we've got two really good footballers in there in Burke and Holmes. "They started a lot of the play for us. The three in front where there to support Graham Bayne up front, but in the second half we were too deep and they weren't getting up to them. "Credit to Hearts, they changed their system and stopped our full-backs getting forward as well. "It didn't look like a penalty for me and I'll need to see it on television." 90:00+3:44 The referee ends the match. 90:00+2:43 Scott Muirhead takes a shot. Corner taken by William Gibson, Suso Santana manages to make a clearance. Save made by Janos Balogh. 90:00+0:04 Gordon Smith is flagged offside by the assistant referee. Free kick taken by Greg Fleming. 88:59 Suso Santana takes a shot. Save made by Greg Fleming. Short corner taken by Craig Thomson from the right by-line. 87:35 Long range shot from Ruben Palazuelos misses to the left of the target. 86:54 Austin McCann crosses the ball. 82:44 Centre by Jose Goncalves, Alex Burke makes a clearance. 81:01 Substitution Austin McCann replaces Greg Ross. Correction - 79:39 Craig Thomson delivers the ball, clearance made by Scott Muirhead. 79:39 The ball is crossed by Craig Thomson, Scott Muirhead manages to make a clearance. 76:31 The ball is delivered by Jose Goncalves, Neil McGregor manages to make a clearance. 74:47 Substitution Andy Kirk is brought on as a substitute for Nick Phinn. Correction - 72:48 Substitution Gary Glen leaves the field to be replaced by Gordon Smith. 72:48 Substitution Gordon Smith replaces Gary Glen. 72:48 GOAL - Michael Stewart:Hearts 2 - 1 Dunfermline Power penalty scored by Michael Stewart. Hearts 2-1 Dunfermline. 71:38 Booking Suso Santana goes into the referee's book. 71:27 Booking William Gibson is cautioned by the ref for unsporting behaviour. Correction - 70:55 Penalty awarded for an unfair challenge on David Obua by Neil McGregor. 70:55 Unfair challenge on David Obua by Neil McGregor results in a Penalty. 67:59 The ball is sent over by Scott Muirhead. Corner from left by-line crossed in by William Gibson. Corner taken right-footed by Andrew Dowie, Header by Greg Ross from deep inside the penalty area misses to the right of the target. 65:09 The assistant referee signals for offside against David Obua. Greg Fleming restarts play with the free kick. 64:20 Inswinging corner taken from the left by-line by Craig Thomson, Neil McGregor manages to make a clearance. 64:12 A cross is delivered by David Obua, blocked by Alex Burke. 62:51 Joe Cardle takes a shot. Save by Janos Balogh. 61:34 Suso Santana takes a shot from long distance which goes wide of the right-hand upright. 61:26 Gary Glen produces a cross, Alex Burke manages to make a clearance. 61:00 The ball is delivered by Ian Black, Graeme Holmes manages to make a clearance. 58:41 The ball is delivered by David Obua, Greg Fleming makes a save. 55:40 Substitution Calum Woods leaves the field to be replaced by Joe Cardle. 55:40 Assist on the goal came from David Obua. 55:40 GOAL - Gary Glen:Hearts 1 - 1 Dunfermline Gary Glen finds the back of the net with a headed goal from inside the area. Hearts 1-1 Dunfermline. 53:19 The ball is swung over by David Obua, Neil McGregor makes a clearance. 50:15 The assistant referee signals for offside against Greg Ross. Craig Thomson restarts play with the free kick. 49:53 The ball is sent over by David Obua, Andrew Dowie manages to make a clearance. 46:17 A cross is delivered by Craig Thomson, Calum Woods manages to make a clearance. 45:00 Substitution Ian Black replaces Lee Wallace. 43:52 Gary Glen takes a shot. Greg Fleming makes a save. 41:02 Corner taken right-footed by Craig Thomson, David Obua takes a shot. Scott Muirhead makes a clearance. Corner taken by Craig Thomson. 40:15 Michael Stewart delivers the ball, Neil McGregor manages to make a clearance. 37:38 Graham Bayne is ruled offside. Jose Goncalves takes the free kick. Suso Santana is flagged offside by the assistant referee. Indirect free kick taken by Greg Fleming. 35:44 Andrew Dowie challenges Ismael Bouzid unfairly and gives away a free kick. Craig Thomson delivers the ball, Effort from the edge of the penalty area by Marius Zaliukas goes wide of the left-hand post. 34:13 Foul by Andrew Dowie on Gary Glen, free kick awarded. Direct strike on goal from the free kick comes in from Craig Thomson, The assistant referee signals for offside against Marius Zaliukas. Greg Fleming takes the free kick. 33:23 The ball is crossed by Lee Wallace, Neil McGregor manages to make a clearance. 32:29 The ball is swung over by Lee Wallace, clearance made by Neil McGregor. 32:08 Ruben Palazuelos delivers the ball, Scott Muirhead makes a clearance. 28:57 Effort on goal by David Obua from inside the area goes harmlessly over the bar. 26:37 William Gibson handles the ball and concedes a free kick. Free kick crossed by Craig Thomson, Greg Fleming makes a save. Correction - 21:26 Ismael Bouzid gives away a free kick for an unfair challenge on Neil McGregor. Greg Fleming takes the free kick. 20:56 Scott Muirhead is ruled offside. Janos Balogh takes the direct free kick. 18:01 The ball is delivered by Craig Thomson, clearance by Neil McGregor. 17:31 Scott Muirhead challenges David Obua unfairly and gives away a free kick. Michael Stewart takes the direct free kick. 16:27 Free kick awarded for a foul by Jose Goncalves on Graham Bayne. Scott Muirhead has an effort direct from the free kick, save by Janos Balogh. 15:34 Corner from left by-line taken by William Gibson. 14:18 Assist by Graeme Holmes. 14:18 GOAL - Graham Bayne:Hearts 0 - 1 Dunfermline Graham Bayne scores a headed goal from just inside the penalty area. 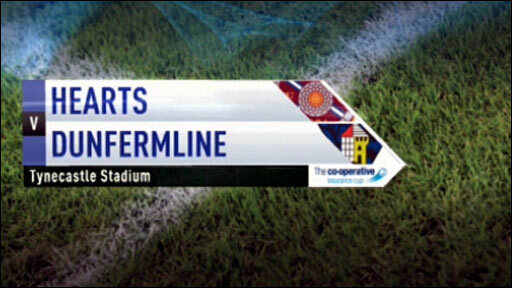 Hearts 0-1 Dunfermline. 13:11 Gary Glen is caught offside. Greg Fleming restarts play with the free kick. Correction - 12:09 Foul by Ruben Palazuelos on Nick Phinn, free kick awarded. Strike comes in from William Gibson from the free kick, save made by Janos Balogh. 12:09 Free kick awarded for an unfair challenge on Nick Phinn by Ruben Palazuelos. Direct effort from the free kick comes in from William Gibson, Janos Balogh makes a save. 9:14 The ball is sent over by William Gibson. 4:22 The ball is crossed by Craig Thomson, Ismael Bouzid takes a shot. Save by Greg Fleming. 0:45 Scott Muirhead delivers the ball.